I read this article and found it very interesting, thought it might be something for you. The article is called Restaurant Review: Taste at Rustic Stone and is located at https://www.totallydublin.ie/food-drink/restaurant-review-taste-at-rustic-stone/. Taste is Dylan McGrath’s new dining room, at the top floor of The Rustic Stone. The kitchen is designed around an open bar, much like the set-up of the tapas bar at Fade Street Social, McGrath’s other spot around the corner. There are around ten chefs working at their stations and getting a seat at the bar underneath the reflective roof means I can watch closely as they fine-tune their contributions to our meal. The concept of Taste is to explore the five key taste; salty, sweet, sour, bitter and umami. Much of what has appeared on the menu has been refined in the development kitchen McGrath had purpose built. The physical menu is designed like a fan that folds out into a matrix of flavours reflecting the five tastes. It’s enormous and unwieldy. I’m a bit overwhelmed by the grid and so I plump for the €40 omakase menu, a set menu where the kitchen makes decisions for me. Phew. Our broths and sushi arrive simultaneously. I dive into the salty dashi, which has a tantalisngly caramel colour, and is full of cockles and mushrooms, alive-alive-oh. I adore it. The broth has the depth that’s missing from most bowls of miso in the city. My slender and delicate trio of nigiri, and the crispy, crunchy prawn tempura roll is the best sushi I’ve had outside of New York City. It’s time for our mains of wagyu beef and chicken rubbed in Peruvian spices cooked over coals. We’re nervous as the waiter carefully places a stone bowl full of piping hot coals in front of us; he does it without even breaking a sweat. The beef is perfect, and I love the salty bonito flakes served as a seasoning on top. The chicken feels a bit out of place; Peru gets a shout out on the menu thanks to the cooking over coals method, but the flavour doesn’t fit with the finesse of the Japanese offering. The meat continues to cook quite enthusiastically over the hot coals in front of us. The chicken dries out a bit, and we have to wave away the smoke when it pipes up. For dessert, I can’t resist the smoked Japanese cheesecake. It’s as weird as I was hoping it would be. It’s not sweet really, but is instead a smoky wheel of savoury cheese, served with caramel popcorn. It’s a dessert for people who prefer when umami outweighs sweet. A creamy flan with ginger ice cream is a delightful combination of sweet, creamy and fiery. McGrath makes an appearance close to midnight, to have a word with his sous-chef. He has a reputation as a creative perfectionist; he surveys the room, nodding quietly as his sous-chef presumably relays the events of the evening at Taste. His intensity is quite intimidating, and I wonder what it must be like to work with him. I imagine it’s like a hugely inspiring broth served with a side dish of motivating fear. He seems intent on raising the bar with every morsel of food served out of his George’s Street triangle, and we, the eaters, can only benefit from that. I give the restaurant a call after my visit to chat through the teething issues, and they’re already on the case. 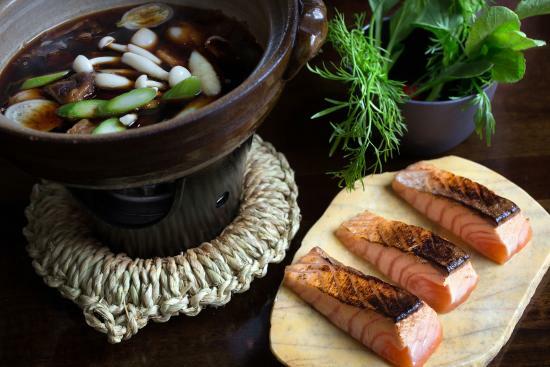 As of this month, the fan menu with its grid system is out, replaced by a more traditionally characterised menu; appetisers, sushi, warm bites, sashimi, steaming pots of rich flavour stock; from the grill and sweet things. The omakase tasting menu remains. It must be frustrating when your customers don’t get your concept but McGrath and his team are gracious in defeat. Our bill, which includes a large sparkling water (€3.50), a large still water (€3.50), and three mocktails (€4 each) comes to €107.00.